In combination with the Epic MyChart app, patients can now access lab results, meds, vitals and more. Cleveland Clinic announced Monday that its patients can now access their personal health data on their iPhones with the Health Records feature. That, together with Cleveland Clinic's version of the Epic MyChart app, offers patients more comprehensive mobile access to their own health data and a way to manage appointments, message their physicians and more, officials said. "Access to one's own medical records is a crucial part of the digital transformation taking place in healthcare today, and enhances our relationship with our patients," Peter Rasmussen, MD, a neurosurgeon and medical director of digital health at Cleveland Clinic, said in a statement. "Our goal is to make that access as easy, convenient and useful as possible, placing patients firmly in the center of their own health data." 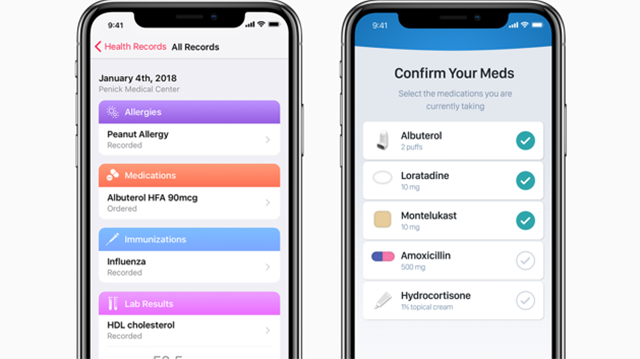 Synced together and updated in tandem, the MyChart and Health Records apps will let iPhone users access their personal health information – allergies, conditions, immunizations, labs, medications, procedures, vitals – and organize it alongside health data from other providers. They'll also be view upcoming and past appointments, physician notes and details about hospital admissions. They can schedule appointments, request medication renewals and preventive care procedures and message their providers as well. The apps will enable patients to "track important health factors, such as weight or cholesterol or blood sugar, to determine their own personal trends over time," added Amy Merlino, MD, Cleveland Clinic's chief medical information officer. "They are able to easily see a combined view of their information from multiple health systems, as well as have the ability to share their healthcare history with other providers." Cleveland Clinic was not among the initial 39 health systems to first launch the Apple Health Records service, but it's little surprise that the innovation leader has been quick to embrace the technology. The health system has a long history of developing apps for its patients, and it has made patient engagement and experience a centerpiece of its mission. As Adrienne Boissy, Cleveland Clinic's chief experience officer explained at HIMSS18, it's long past time for healthcare to catch up to patients whose expectations of access and convenience have been shaped by consumer technology. "The Amazons and Apples of the world have mastered service, and they are coming for us," said Boissy.